Illustration for NBC news on racial discrimination in traffic stops. Art direction by Kara Haupt. Illustrations for MCD Books for a short story Ghost Hardware, part of INFINITE DETAIL, a near dystopian novel by Tim Maughan that examines reliance on technology by suggesting a series of calamities that might follow the collapse of the Internet. Art Direction by Lindsay Johnson. Illustrations for Narratively for the article ‘My Coming Out Story, Starring a Priest, an Animal Sacrifice and Ricky Martin’ by Jorje Novoa. Art Direction by Vinnie Neuberg. Digital exclusive illustrated cover for Architectural Digest India’s September 2018 issue featuring one of India’s biggest fashion designers, Sabyasachi Mukherjee. Illustrations for Architectural Digest India’s September 2018 issue, for an artist collaboration portfolio featuring a selection of iconic fashion and furniture. Illustrations for Buzzfeed News for a short story Just Friends by Neel Patel. Print exclusive illustration for the New York Times Sketchbook section, based on the NFL kneeling ban. Art Direction by Andrew Sondern. Illustration for Baffler Magazine’s article, ‘Othering the Godman’, a critique of the Netflix docu-series ‘Wild, Wild Country’. Ilustration for New York Times’ Opinion section, ‘The Truth Trump Doesn’t Want You to Know About the Caravan’. The article is about caravans of immigrants from Central America and Trump’s incorrect portrayal of them as a danger, stirring the rage of bigots. Ilustration for New York Times’ Opinion section, ‘What Robert Mueller Knows’. The article is about questions Robert Mueller posed for Trump, part of the yearlong Russia investigation. Illustration for Issue 5 of Bmore Art magazine. The illustration accompanies an interview with author Barbara Bourland about why she stopped doing make up, and explores ideas around women’s bodies, clothing, power and the gaze. Illustrations for Caravan Magazine’s article ‘Love the Sinner, Hate the Sin’. The article speaks about the influence of church in the state of Mizoram, India on the queer population. Promotional illustration for launch of 'Hu Holi', Pharrell's new Holi inspired collection for Adidas Originals. Poster design and illustration for a Bollywood themed party at Motor House, Baltimore. Illustration for an article about how going to a clothing swap helped a woman embrace her weight. Illustration and poster design for Gaysi Family's Mumbai pride event. Geo filter designs for Snapchat for various locations in Delhi, Mumbai, Kolkata and Bengaluru. Google doodle illustration celebrating Cornelia Sorabji's 151st birthday. Cornelia was India's first female lawyer. Final illustration (top) and concept/ rough options. Read up more on Cornelia and the doodle process HERE. 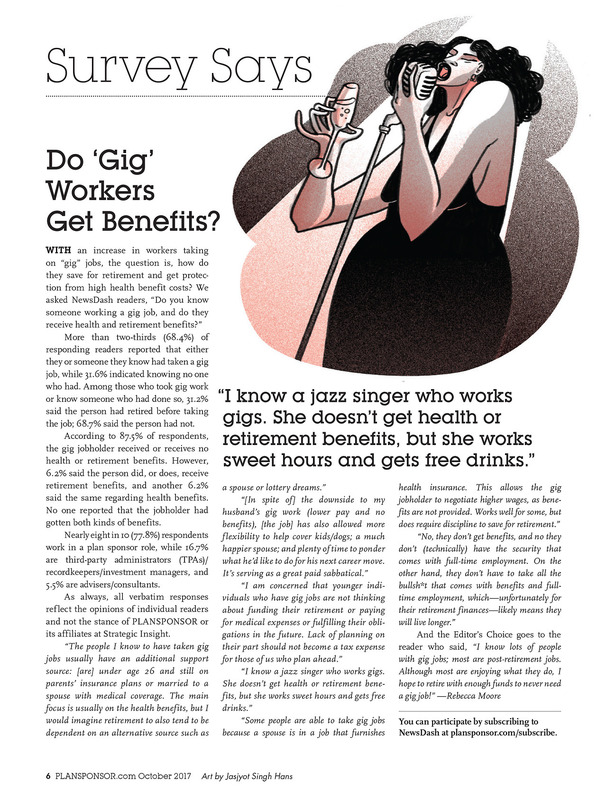 Illustration for Plansponsor October 2017 issue; on pros and cons of 'gig work'. Spot illustrations for a written piece Thisty by Traci Spacek for Hyrsteria zine issue 1. The piece centres around a woman's sexual encounter and the stigma associated with Herpes. Poster visuals for Prateek Kuhad's international tour. Illustration celebrating pride, and the wonderful people that have supported me over the years to become a proud queer Sikh man. Basti (Indian neighbourhood community) themed sticker pack for Google. Chat sticker pack for for Google for their messaging app, Google Allo. The pack explores nuances of an Indian family through the characters of two siblings, an evil aunt and a groovy granny and uses commonly used Indian phrases in Hindi. Illustration for Vogue India on Indian authors opening up to queer lead characters in their fiction work. This particular book features a queer werewolf as the protagonist. Cover illustration for Studio Kokaachi's short comics anthology, Mixtape volume 2. Type by Prabha Mallya. Buy Mixtape Volume 2 here. Illustrations and plant animation for Péro's nursery themed SS 15 fashion collection. Poster visual for MICA graduate community event Salon. Illustrations for Deltin group of luxury hotels and casinos in India. Illustration for Apple Music's International Women's Day campaign with Kulture Shop.